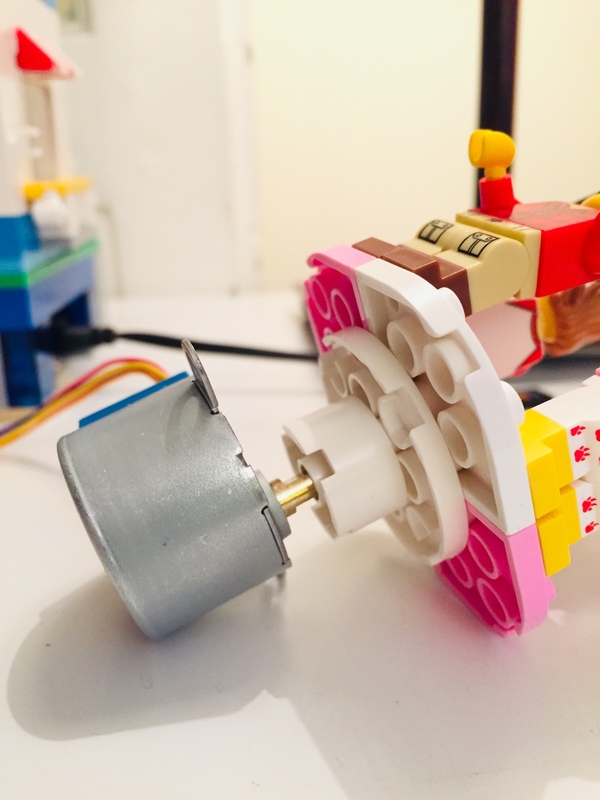 Use LEGO bricks and Hackeet Low-Code platform to build a voice-activated weather station that respects your privacy. 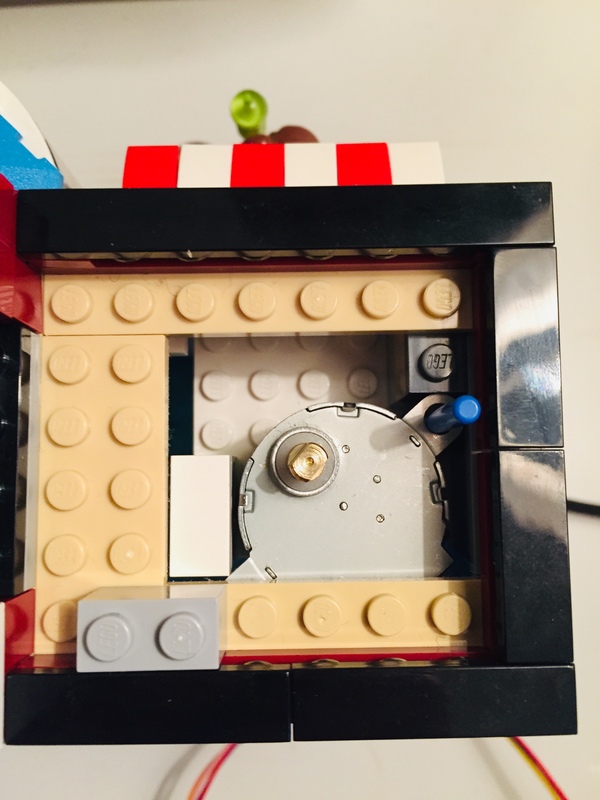 In this project, we are going to show you how to build a funny and personalized weather station that reacts to voice and respects your privacy without being an engineer. 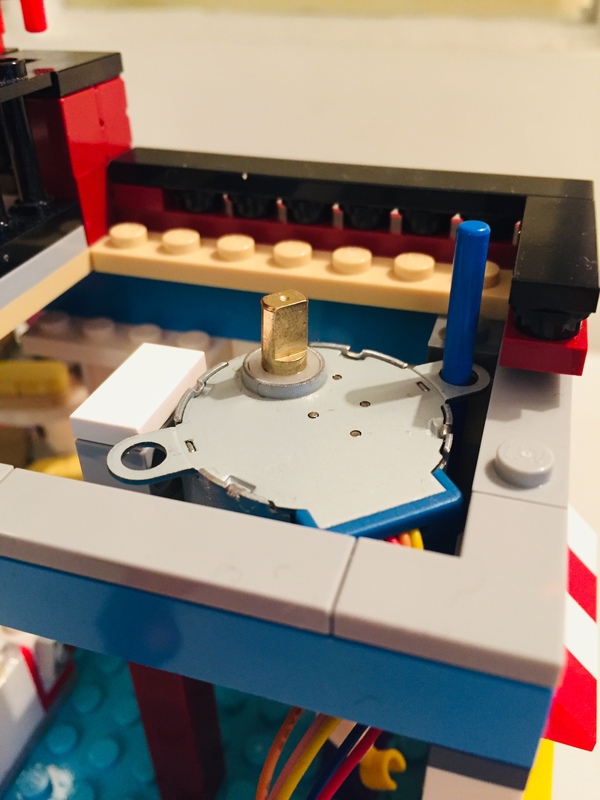 This station will take the form of an animated carousel built from LEGO bricks on which will be attached LEGO characters, each indicating a state of the weather (rainy, sunny, cloudy, alert). This station will be able to react to commands such as "Hey Snips, what's the weather like in Paris " by rotating the carousel to display the right character just as shown below. In order to achieve this, we are going to use stepper motors for rotating the carousel, Snips.ai for performing voice recognition, the OpenWeatherMap web service for getting forecast and Hackeet Low-Code platform to develop the the application that makes the glue between all these components. At the heart of the weather station will be a Raspberry Pi on which all applications will be installed and that will be in charge of all the magic. Hackeet is a low-code visual programming tool that allows you to connect hardware or software components together to create Web Applications and Micro-services for Microsoft Windows, Raspberry Pi and Arduino / ESP8266 devices.. Designed for makers, small businesses, developers and anyone that is interested in technology, Hackeet allows you to create your own apps easily and at an incredible speed by connecting boxes instead of writing tons of code. As we value privacy, Hackeet is not another "platform as a service" offering and does not use any hidden cloud architecture. Applications built with Hackeet run directly on your own hardware as regular private application. Check out our website to get more details! Let's start building the project! First of all, we have to build our station from LEGO bricks! Of course, the point here is not to teach you how to do LEGO (we guess that you all do know :-)). Nevertheless, if you want to save some time, we provide you with the diagrams of the design we have used for this project. Such design should allow you to easily change the decoration of your weather station without having to rebuild everything from scratch. You can obviously use any design you want and any LEGO pack you have, not only the one we have put in the project's description (especially for the decoration) !! Just make sure to have enough room for the boards and the wiring. Sketchup files for pedestal are available for download here! Let's now consider wiring together all the hardware components. We use a LED as a status indicator that will light when the weather station is ready to listen to the commands (after you say Hey, snips). Below is the detail of the whole wiring. You can add a resistor between the Raspberry Pi and the LED to protect it if you wish. We have hidden the status LED in the candy dispenser to get a nicer effect when talking to our weather station. Forecast are retrieved from OpenWeatherMap using the REST API. In order to use it, you need to grab a free API Key here. In order to perform voice recognition, we use Snips.ai, a private by design voice assistant technology that is able to run on a Raspberry Pi 3. Make sure that you have correctly installed the Snips.ai weather assistant (normally installed by default) by performing tests as described here. Okay, so good so far! Let's now install Hackeet on your Raspberry Pi. "license":"Link to the web service license file"
Edit the Key parameter to set your actual OpenWeatherMap key. Edit the StepsByRevolution parameter to set the number of steps by revolution for your stepper motor. By default, we consider that there are 2048 steps by revolution. Set the Frequency parameter to specify the frequency (in Hertz) at which the motor will operate (typically between 200 and 500). If you set a value that is too high, your engine may miss events and may not work properly. Finally, specify a location for which the weather station will default to the upcoming weather by setting the City and Country parameters. 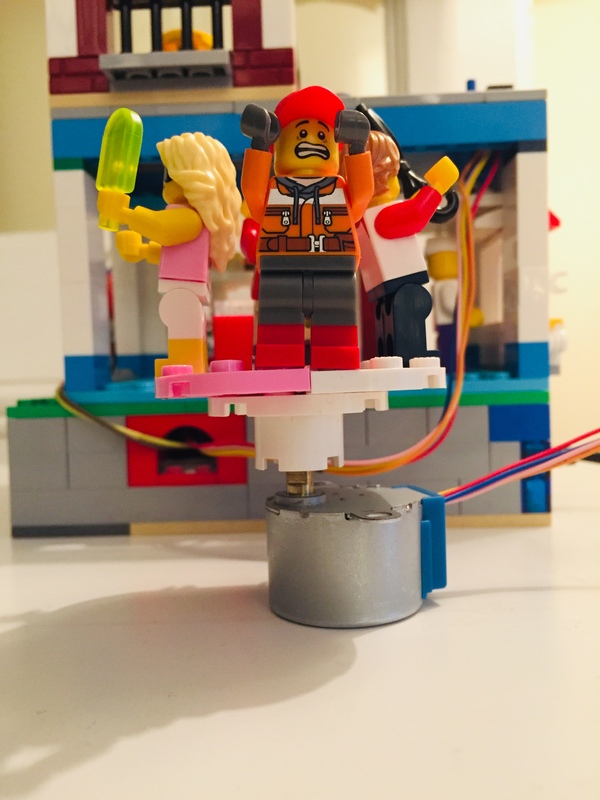 First, before starting the application, manually adjust the carousel to display the "sunny" LEGO character, which is the default start position. You can also use the crontab to start the application automatically each time the Raspberry Pi boots. If you choose this method, you may find the tool Cron Gui very useful. The carousel then rotates to display the forecast for the requested location and, after a short time, returns to the position of the forecast for the default location. We will not go into details on how to program with Hackeet. If you would like more information on this topic, we recommend you visit our website for documents and tutorials. You can also check out our previous Hackster.io project that describes the basics of programing with Hackeet. A project file to open with Sketchup.